I bought myself the cutest pair of shoes and just have to share them with you. 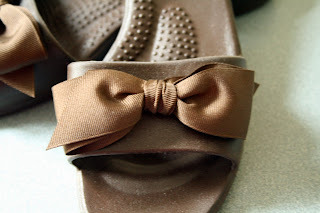 They are called OkaB shoes and they're cute and comfy...and they have a BOW on them! Love them! They're kind of rubbery, but don't look like plastic and they don't look like Crocs...which is good because I'm not a fan of Crocs. And, the website I bought them from sends you extra colors of ribbons! 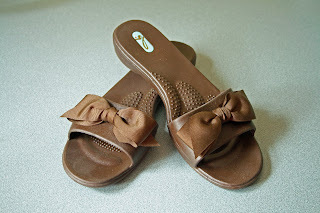 I ordered from Little Bow Peep Fairy Tales because I've never seen these shoes locally. The seller was great to work with and now I want to order more OkaB shoes! Do you have any? What should I order next? 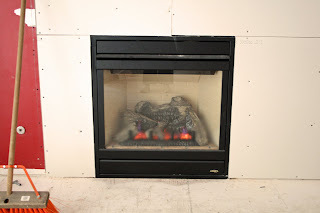 We are thrilled to be upgrading and updating our fireplace as a part of this home renovation. Our old fireplace was drafty beyond belief, had gaudy gold trim, and had floor tiles applied to the wall...oh and random chunks of adhesive periodically fell from behind those wall tiles. They were barely holding on! After the old (13ish year old) fireplace was removed, our contractor discovered there was a 1/4 inch gap in the plywood at the bottom of the fireplace box...no wonder it was breezy in our family room! Our new fireplace is just a bit bigger (taller) than our old one and has a stronger blower, too, so we'll get more heat from it. 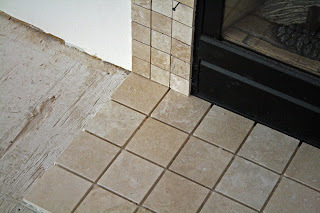 I selected travertine to go around the fireplace and the mantel will be white...no pictures of that yet because it isn't built yet! 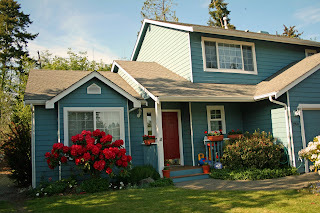 Our contractor will be building it for us. Luckily he's finally understanding how particular I am about things and is doing things to my specifications--including my mantel top that I want to be between nine and ten inches wide on top! 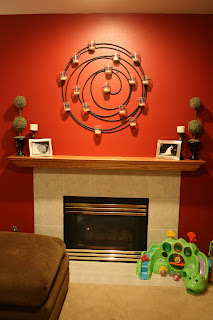 No more skinny mantels that are hard to decorate! I found my inspiration mantel on Flickr. The woodworker did a gorgeous job on this mantel! I want mine to be a bit more simple (not so many insets) especially since my fireplace opening is bigger than this one...but this certainly is beautiful! And, we're off! 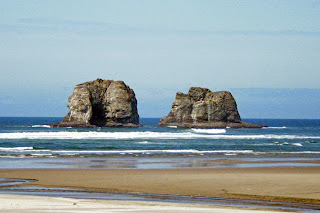 Off to the coast--for a week! 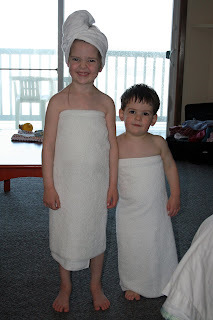 My aunt and uncle are generously giving us a week at their time share condo for the fourth year in a row--we love going there! The condo isn't fancy, but it is perfect for our family and we appreciate this opportunity SO much. We'll be seeing lots of these! 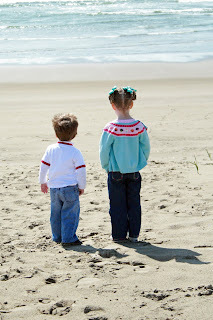 Going on lots of beach walks! 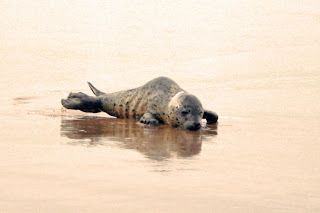 Maybe we'll even see another baby like this on the beach! 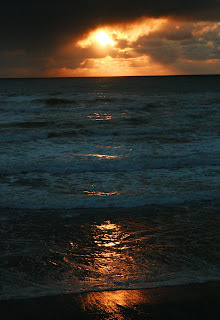 And we pretty much always see these gorgeous sunsets over the water...right from the condo balcony! We'll be back next Friday!! 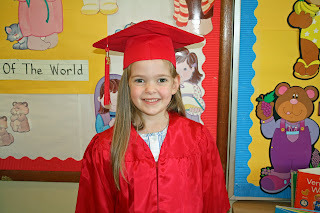 Princess graduated from preschool for the third time...but this time it is for REAL! 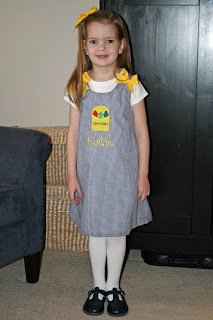 My baby girl truly is all done with preschool now and is off to kindergarten in the fall. Sniff, sniff. 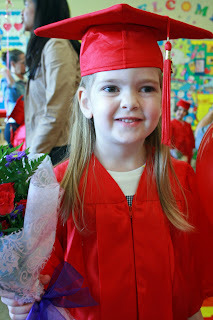 She has three years of preschool under her belt and is more than ready for kindergarten--but it still is hard to leave preschool behind. 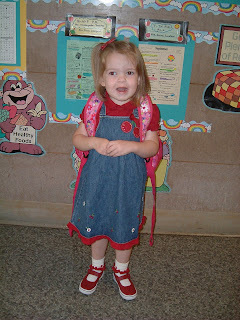 Here she is on her first day of preschool in September of 2006...so little...not even three yet! 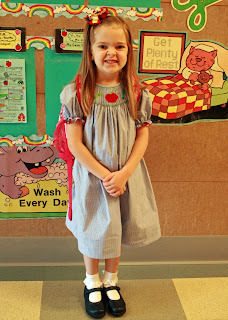 She was so excited to be going to preschool. 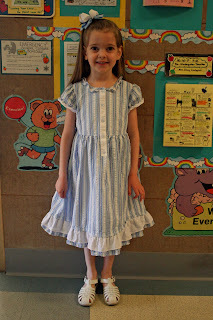 She was the only child in the class who cried (and screamed!) when it was time to LEAVE school. 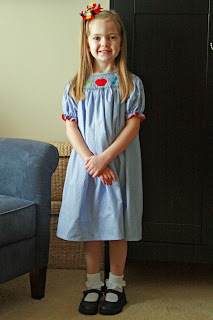 She grew up SO much in that year--here she is ready for her last day of preschool at the end of her second year. And then my sweet girl graduated...again! 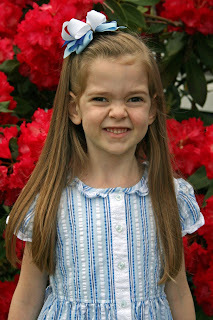 In September of 2008 she started her final year of preschool. This time around she went three afternoons a week. She was so excited! 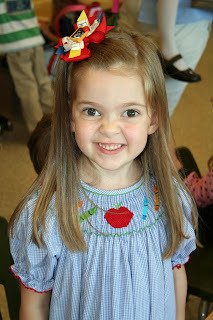 Yes, definitely excited to be back at preschool! 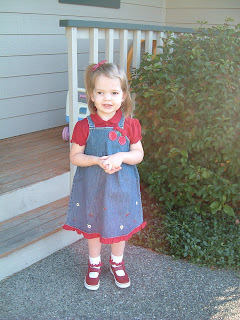 Now here she is today...her last day EVER of preschool. She is so beautiful...and still my baby despite her height! 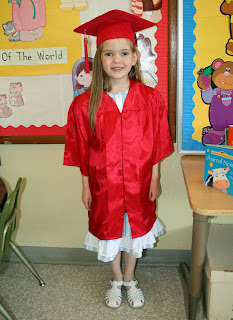 And the preschool graduation robes definitely haven't grown at the same rate as my girl! Happy "Congratulation" Day, Princess! (Those are her words!) I love you forever and always. I'm so proud of you and I hope you love kindergarten as much as you loved preschool. 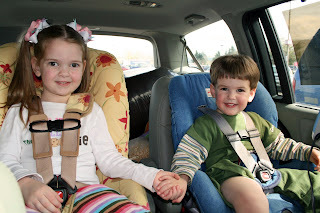 The children and I were out running lots of errands on Tuesday and we ended our morning at Goodwill. I rarely find good stuff at Goodwill, but this trip was an exception! 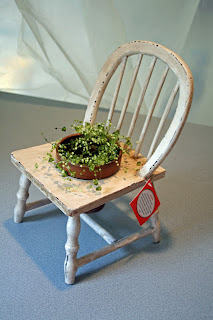 $2.99 for this little chair and its pot of (bizarre!) green beads. The tag still is on it! I think it will look very sweet with a real little potted plant inn it...and I might not even repaint it. I'm still deciding. I found this in a bin of stuff that hadn't yet been put out on the floor and scooped it right up! 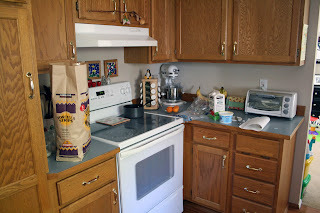 The seat of the little chair is about five inches off my counter, so it is a good size. One thing I do always find at this Goodwill are books for my children. 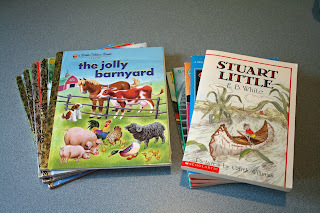 All children's books are 79 cents and (unlike Value Village) they don't discriminate between little kid books and chapter books--they're all the same price! The Golden Book on the top of the pile on the left has never even been opened! The cover still is all stiff! This is my very favorite find! 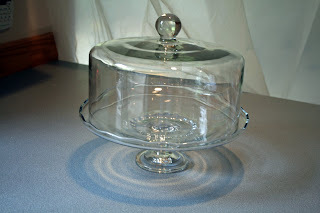 A gorgeous heavy glass cake dome with NO CHIPS for only $6.99!! Score! The twenty-something male cashier even commented on my find when he rang me up! We are six weeks into what was supposed to be a six-eight week project. I'm thinking it will be more of an eight-ten week project. Please, please, please don't let it stretch beyond that! Yes, I'm looking forward to the additional space, but I'm soooo tired of having all these people invading my home. Do you see that picture? There were FIVE different jobs (you can't see one of the five trucks) being done here at the same time. 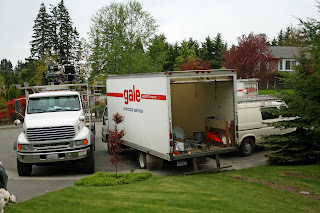 Lumber, gutters, insulation, fireplace, and our general contractor...all.at.the.same.time. I'm a control freak and this drives me crazy. Actually, wait--what REALLY drives me crazy is that these people seem to think it is okay to PARK at the bottom of my driveway. Keep in mind that my Honda Odyssey is *in* my driveway these days because our garage is full of our family room furniture right now. Why on earth would you park someone in? Especially since there is plenty of parking in our cul-de-sac during the day. Now that I'm done venting (for now! 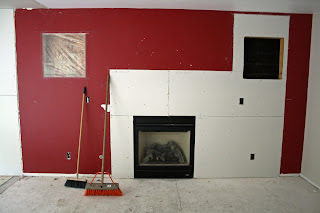 ), here is a new look at my fireplace wall...with a new fireplace, window holes, and DRYWALL (with insulation behind it!) Phew! 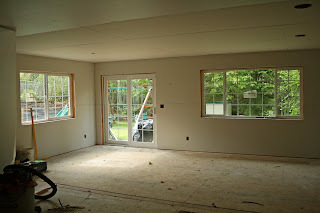 It was getting rather chilly in here with no insulation or drywall! Another look at our new gas fireplace. When they removed our old fireplace, they discovered the reason we had a big (and I do mean BIG!) draft across our floor--there was a 1/4 inch gap in the plywood that the builder had never sealed. Brrr! This fireplace is a bit bigger than our old one and the blower is stronger--so we'll get more heat out of the fireplace too. What I'm most excited about though, is that there is no gaudy gold trim on this one! 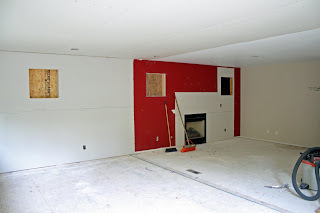 This is looking from the old part of the family room toward the new part. SPACE! Actually, right now the space is so big and open that we have quite an echo going on downstairs. I'm looking forward to that going away when our furniture is back in the family room. The siding is going up on the outside of the addition. 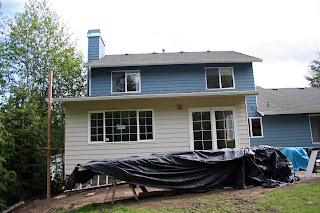 Hopefully once the siding is painted, the addition won't stick out quite so much. 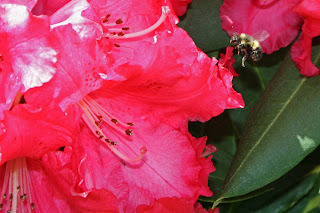 The bees are buzzing and the flowers in my yard are beginning to bloom! Spring really is here...at least for a few days! We've had a handful of days with glorious weather and the sunshine has jolted my spring flowers into bloom! 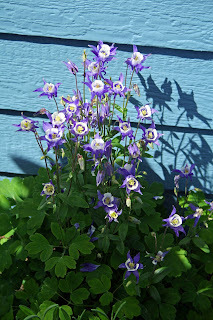 I have three of these columbines under my front window. They're about three times the size they were when I planted them a few years ago! 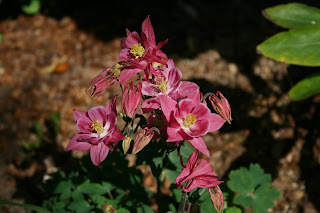 This is one of my new columbines that I just planted this past week. This flower is my new-found love! Zoom in on the picture--the folds on the blooms are amazing! The structure of the bloom just is really really neat. The plant is called Leprechaun's Gold and is gorgeous! The leaves are a yellow-gold and just so pretty. Love it! 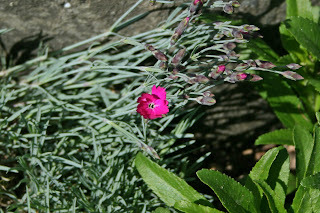 My dianthus just are starting to bloom--soon they'll be a rim of pink around the front edge of this bed. Here is a sideways (overexposed--it was bright outside!) shot of the bed under my front window. Lots of plants still growing--I see lilies, black-eyed susans, and daisies yet to come! Oooh, and one of my hellebores is trucking along in there too! This bed is really coming along well. 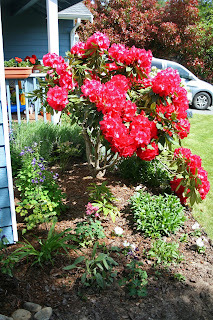 I think in another three years or so, it will be a mass of blooms from the late spring through summer! Here is another view of that same bed. Isn't the rhody gorgeous?! I've been slowly and steadily pruning it back to health for the last few years. It was spindly and not too healthy when we moved in five years ago, but now it is doing great! This year I need to prune the height down a bit because it is getting too tall for the space--I'm 5'10" and the top blooms are at eye level with me! 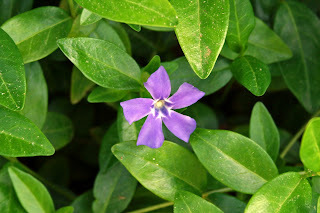 Vinca--ahhh how I love thee! My vinca is just about done blooming for the year. It is my very favorite groundcover. 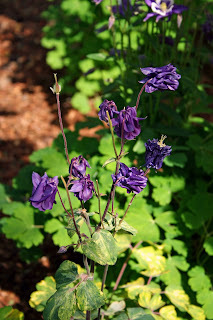 I'm lucky because in my area it is a perennial and comes back again and again. I just love seeing those little purple flowers bursting into bloom at the start of spring each year! 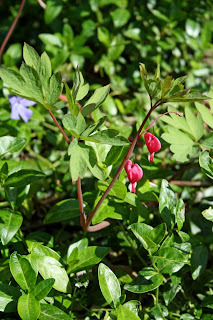 My lone bleeding heart! This is in my backyard and I was so excited to see these two measly blooms. I thought the construction work destroyed my three bleeding hearts (the plant was dormant when construction started, so I couldn't see where to dig them out)...but apparently one survived! 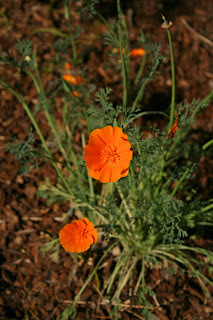 I planted a couple of California poppies in my backyard this year. This is near the grass in the backyard and the plants need to be sturdy because stray soccer balls sometimes come rolling through here! 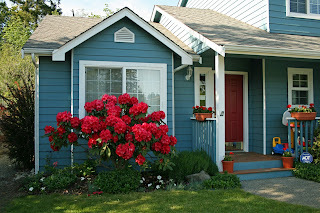 The last couple of years I've tried to be good and spend my money mostly on perennials rather than on annuals (although I did buy geraniums for my pots and some petunias for my front yard) so that I can enjoy the flowers year after year. Although I like the instant gratification of annuals, I do like looking forward to seeing my perennials pop out of the ground and it is exciting to see them get bigger each year. Yesterday I was at our local grocery store and they were having an amazing deal on organic strawberries--buy one pound for $2.98 and get two pounds free! I love a deal like that! Soooo, I came home with nine pounds of strawberries. I wanted to buy even more, but was a bit worried about where I would put them all. 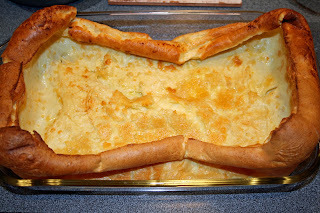 Luckily earlier in the day I saw a recipe for Puff Up Pancakes over at Leigh Anne's blog. I love her blog, by the way--lots of fun recipes and the way she shares her parenting skills and life advice is very approachable. Good pictures, too! Anyhow, the pancakes sounded fun...and she said they tasted great with strawberries...so I knew what we were having for dinner! The pancakes are super easy to make in a 9x13 pan in your oven. 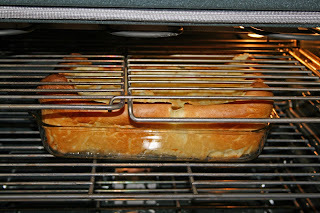 Mine puffed up so much that it got tangled up in the top rack in my oven! Whoops! Luckily it deflated a bit when it came out of the oven. It was GOOD! Not a traditional pancake flavor, but definitely good. 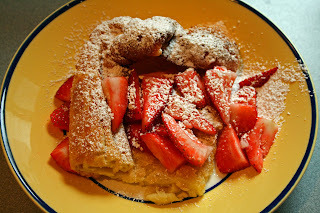 And yes, it tasted good with strawberries and powdered sugar. We all loved this dinner! Unfortunately that only used up one pound of strawberries...I still had eight more pounds! I had a plan though. 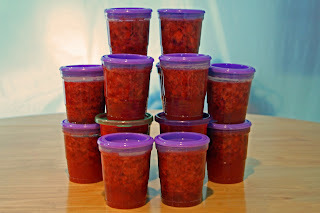 Strawberry freezer jam! We're on our last container of blackberry freezer jam that I made in early September, so this was good timing! That left me with just two pounds of strawberries. A much more manageable amount for my family of four! In fact, we ate another pound of them today! Yum! Why is it that having my husband make lunch for the children always *seems* like a good idea? 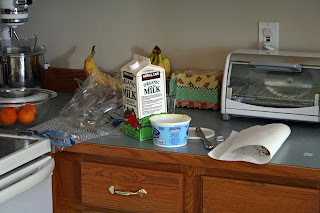 Because really, if I thought about it, I would remember that *every* time, I'm left with a mess like this...hours later. And no, the milk container wasn't empty. Look What I Ordered Yesterday! 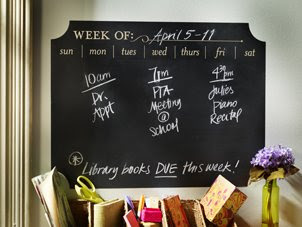 I was catching up on blogs last night and came across this cute chalkboard...from Uppercase Living! Doesn't it look fancy and expensive?! $19.99...plus shipping, tax, blah, blah, blah. 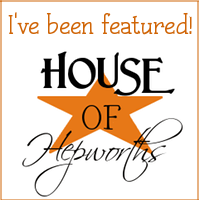 Anyhow, Kim at Today's Creative Blog posted a quick note about it because the promo for it ended on Monday...so I snapped one up! Hopefully some of you saw her posting too and were able to get one. I'm excited about it even though I'm not 100% sure where I'll be putting it. I'm thinking about the laundry room/powder room/mud room...it serves lots of purposes and has an awkward wall that I've never decorated.